The draft budget for fiscal 2018 came in at a whopping 5.19 trillion yen — up 1.3 percent from the previous year. Japan's government has approved its biggest defense budget to date. The draft budget for fiscal 2018 came in at a whopping 5.19 trillion yen — up 1.3 percent from the previous year. It's the sixth consecutive year the budget has increased. And officials say a lot of that money will go toward bolstering Japan's defenses against escalating threats from North Korea. As Japan's minister of defense told reporters, "Our nation's security is under a greater threat. It is significantly important that we procure cutting-edge equipment. It's important that we continue to increase pressure on North Korea to urge the regime to alter its policy." 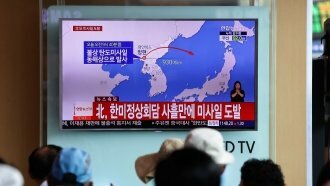 The budget was approved nearly a month after North Korea's latest missile launch. Pyongyang said that missile was tipped with a "super-large" warhead and claims it is capable of "striking the whole" U.S. mainland.